Dubai, November 06 2018: Executives interviewed for the 2018 edition of the Business Barometer: Gulf CEO Survey carried out by Oxford Business Group (OBG) were largely upbeat in their outlook for the coming 12 months, buoyed by higher and more stable oil prices, although regional political volatility remained a cause of concern for many. As part of its survey on the economy, the global research and consultancy firm asked almost 900 C-suite executives from across the Gulf’s industries a wide-ranging series of questions on a face-to-face basis aimed at gauging business sentiment. OBG also will present The Report: Dubai 2019 in the first quarter of 2019, its latest analysis of the emirate’s economic activity and investment opportunities. Nasdaq Dubai was a key contributor to the report, helping to produce in-depth analysis of the emirate’s capital markets. Responding to a separate question, a similar proportion (69%) of interviewees told OBG they thought it likely or very likely that their company would make a signiﬁcant capital investment within the same timeframe, despite facing higher borrowing costs on the back of rising US Federal Reserve interest rates. Business leaders were also positive about the tax environment of the market in which they operate, with 87% describing it as competitive or very competitive on a global scale. In addition, most of those interviewed (70%) felt that the level of transparency for conducting business in their market was high or very high, relative to the region. From those surveyed, the vast majority of respondents said that less than 40% of their business was driven by government spending, while just 15% told OBG that more than 80% of their work came from the public coffers, in a sign that reforms aimed at boosting the role of the private sector were beginning to deliver results. Understandably, regional political volatility remained a key cause of concern for many business leaders, with over 70% citing it as the external event most likely to impact their market's economy in the short to medium term beyond the movements in commodity prices, well ahead of China demand growth and multiple Fed rate hikes. When business leaders were asked about the skills they felt to be in highest demand in the workplace, however, results were more varied. From those interviewed, 23% cited leadership as the skill they believed to be in greatest need, followed by engineering (18%), research and development (14%), and computer tech (10%). Commenting on the results in his blog, Oliver Cornock, OBG’s managing editor for the Middle East, said that higher and more stable oil prices had undoubtedly helped to lift the Gulf countries over the past year, while also providing governments with some breathing space, several of whom had found themselves under pressure to implement difficult reforms with urgency on the back of falling hydrocarbon receipts. Cornock noted that the positive sentiment expressed by CEOs in the survey broadly mirrored the outlook of the IMF, which has forecast real GDP growth in 2019 for all but one of the markets in the region. “The key for governments looking to increase the level of private sector engagement in their economies will be to continue chipping away at the reform and diversification process without knocking this positive confidence,” he said. 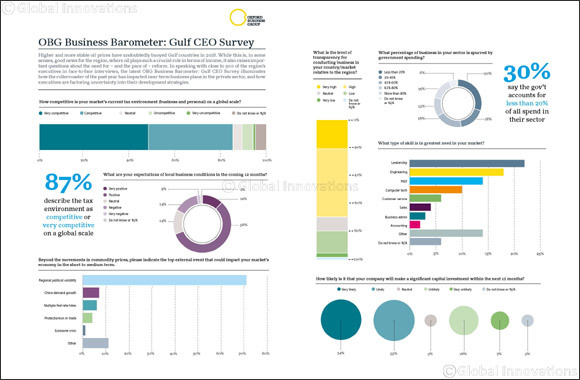 The OBG Business Barometer: CEO Surveys features in the Group’s extensive portfolio of research tools. The full results of the survey on the Gulf will be made available online and in print. Similar studies are also under way in the other markets in which OBG operates.